What is mycorrhiza and what can they do for us ? Mycorrhiza is a symbiotic fungi that will develop when a root comes in contact with the mycoorhiza spore, the mycorrhiza takes care of the contact between roots and soil and with this suplying the plant with needed nutrients and water. In nature there is more then 95 % of the plant life depending on the symbiosis between plant roots and mycorrhizae's. The capacity of the uptake from the roots can be enhanced with 600% and because of this the plant will have less stress and protection against soil diseases. Mycorrhiza lives in a symbiotic relationship with the plant roots what means they will both have benefits from this collaboration. Because of photosynthesis the plant makes sugars as a rest product and will secrete sugar in the soil that will feed soil life and mycorrhiza fungi. Mycorrhiza will produce microscopic fine hairs that will reach every corner from the soil were root hairs can not come and because the mycorrhiza fungi is in contact with the root hairs there will be a optimal uptake from nutrients and water.. Because of this colonisation of mycorrhiza the plant will have a more stable soil environment so roots and plant can perform better. Why are mycorrhiza's important ? A strong balance between roots and soil life is very important for the growth and flowering of plants, a healthy soil will give healthy plants and a better water uptake. Mycorrhizae's and soil bacteria will take care of a effective functioning soil life that will take care of the uptake of nutrients so your plant can focus itself on producing healthy fruits. Bio-sannie Symbiosis will inoculate the right Mycorrhiza's so a strong and healthy colonisation can take place. With 15 years of experience working with Mycorrhiza's we have selected the perfect mycorrhiza strains that can be used with our plants, this combination of mycorrhiza spores will make sure you will get a fast and effective colonisation. Mycorrhiza spores will be active as soon they come in contact with roots, this is why the spores have to be mixed through the soil to get colonisations on several spots in your soil. This is also called mycorrhizosphere. Symbiosis has the right amount of spores to get the fastest results, less spores will delay the colonisation with weeks. When applied on just transplanted young plants the symbiosis can take place in 2 weeks, this means a big time advantage and makes sure your plants will grow healthy and fast. We only sell mycorrhiza spores and not mycorrhiza propagules ( root fragments ) to ensure you get the best quality available. Propagules are not suitable for soil and should be used only on hydroponic set ups, because they can be solved in water and used while watering plants. Soil works like a sieve and will let the propagules stay on the top layer of the soil. Propagules can be sold as very concentrated but it only means the root fragments are cutted some times more what gives a higher propagule count. 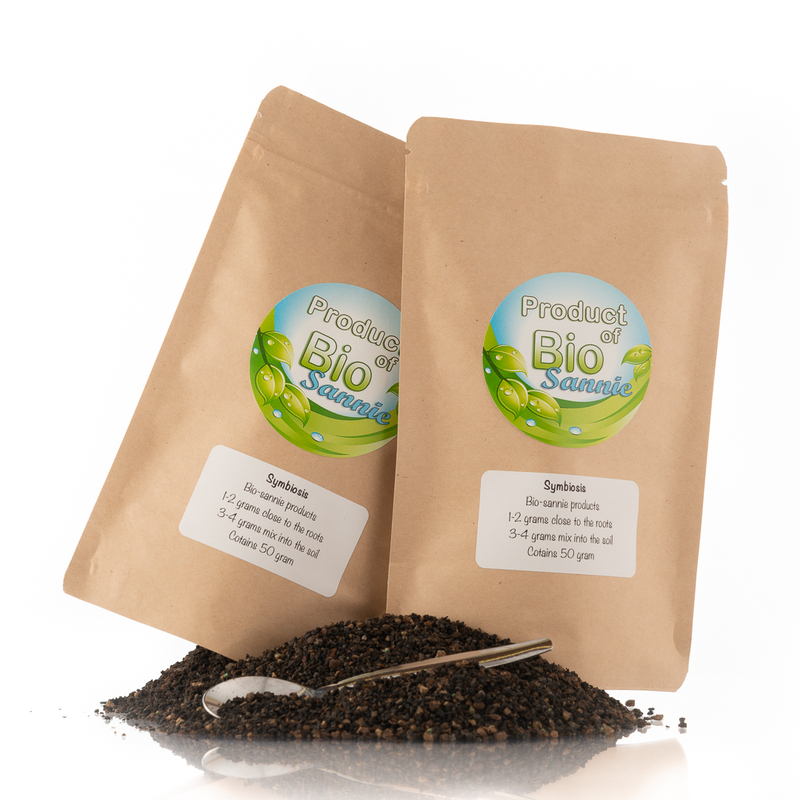 Bio-sannie are Mycorrhiza.eu joined forces to develop the best possible mixture of mycorrhiza fungus that will work on 80% of the plant species and will colonize the roots of the plant. By using strong concentrated mycorrhiza spores we have developed a fast working mycorrhiza inoculant. To make sure your seedling or clones have the best possible start we also included specially selected Rhizo bacteria, that will offer the seedlings or clones the perfect healthy start.